Clear as mud … yikes! To determine compa-ratio, an employee’s base salary is divided by the mid-point of the internal salary range for his/her position. 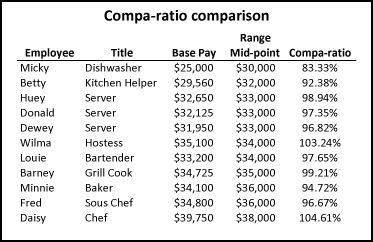 For example, if the mid-point of the range is $50,000 and the employee’s salary is $45,000, then the compa-ratio is 90%.